Can historians know the mind of God? It is a long time since most historians have scrutinised the intentions of the Almighty. Generally, they think that understanding human actions is difficult enough. So, it will have been news to many of them that, in Israel recently the Israeli and Australian governments, in their official commemoration of the 1917 Battle of Beersheba, implicitly blessed the contemporary policies of these allies in terms of an alleged divine plan, supposedly sealed in the blood of Anzac dead. All this occurs in a context of continuing Australian acquiescence in the Netanyahu regime’s promotion of illegal Israeli settlements in Occupied Palestine in violation of the 4th Geneva Convention, which defines as a war crime the colonisation of captured territory. These developments see Israeli ‘hasbara’ information campaigning target the Anzac legend so important to Australians. In fact, the charge of the 4th Light Horse Brigade against the retiring Ottoman rearguard at Beersheba was a rare thing in the Great War, a well-planned assault manoeuvre executed at minimum cost to the attackers. But these glimmers of military glory are hardly sufficient to attach Australia righteously to the Zionist project and its terrorist past, and subsequent wars and brutal military occupation of the Palestinian territories. 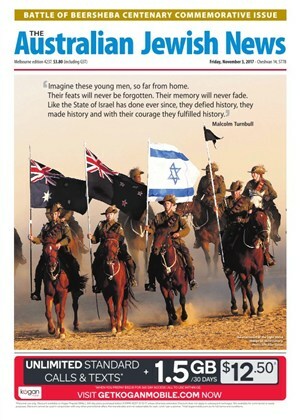 Yet, it is precisely the legitimation of Israel and its oft-proclaimed ‘right to defend itself’ that is the purpose of the historical arguments of Kelvin Crombie, a consultant to the Australian Light Horse Association’s centenary re-enactment of the charge. This legitimation will be celebrated in conjunction with the official ceremonies in the Negev later this year, where the Israeli government is engaged in dispossessing ancestral Bedouin tribes. Crombie got a former Governor-General, Michael Jeffery, to write a foreword to his book – which General Jeffery says ‘provides a masterly account of the Jewish diaspora’s quest over millennia for a home land; a homeland promised to them by Abraham in his covenant with God, partially achieved through the 1917 Balfour Declaration’ – and appear in a promotional video. In Crombie’s view, the Gallipoli landings were intended to take Jerusalem, the geographical centre of Christian fundamentalism. All this at a time when there are calls from the Australian government, the press, the military and strategic think-tanks for closer ties with the Israeli military in tactical doctrine, technology and intelligence. Yet, almost none of the people calling for this have assessed the cost to our national interest in thereby alienating our near neighbours and the lucrative trade with the Arab and Muslim world. Effectively, these celebrations rewarded Israel for political bad behaviour and delinquency in the face of international law. It is simply not good enough for Australia to merely mouth support for a two-State solution while continuing to develop military ties with Israel. In such circumstances, Australia should be suspending defence arrangements with Israel, not reinforcing them. While it is hard not to envy the Machiavellian chutzpah and opportunism of the Zionist attempt to hijack both our history and the national custom of commemoration of our sacred war dead, this is not to condone these phenomena. Historically speaking, it is the kind of rewriting of the past which Orwell warned against. It is certain that the Light Horsemen, as they sat in their saddles before going into action on the late afternoon of 31 October 1917, were not thinking of a divine plan to ‘restore’ the ‘State of Israel’ in 1948, much less condone its bellicose human rights abuses today. To even suggest this, is to abuse and besmirch the memory of these men. Certainly journalist Paul Daley, in a review of hundreds of troopers diaries and letters, found no trace of any conception that the Light Horse were actively doing God’s work to ‘restore’ the State of Israel, as opposed to a general awareness that they were operating in the historic Holy Land. As the historiographer RG Collingwood taught, ‘the aim of history is not to know the past but to understand the present’. Accordingly, history ought not to be an excuse for self-congratulation but a motive for reflection. To do otherwise is to effectively and irresponsibly rewrite history in the image of a complacent present. 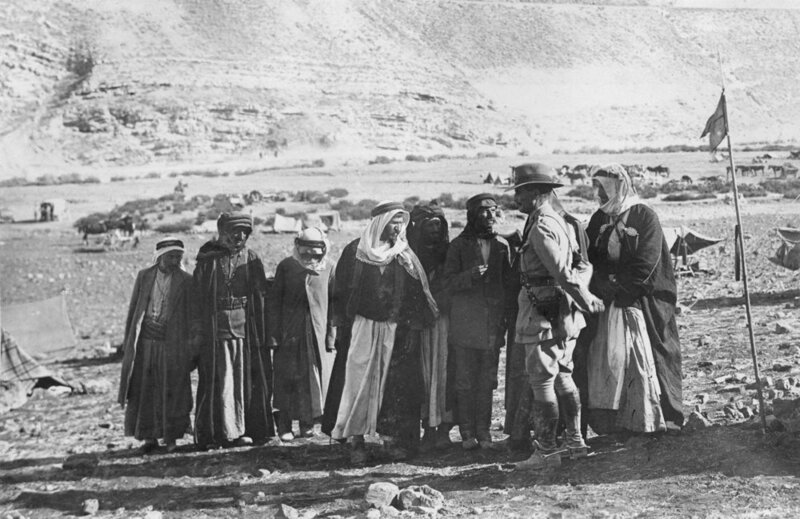 Australia’s participation in the British conquest of Palestine a century ago is grounds rather for a sense of obligation towards the country, in so far as the Nakba Catastrophe of 1948 – the displacement of Palestinians on the creation of the State of Israel – was to flow from the British Mandate protectorate over the Holy Land. That conquest was a British imperial initiative in which our ancestors participated, not an act of military liberation. What is needed now is action to address the neo-colonial legacy of blood, sweat and tears which has resulted, and which has lasted too long in defiance of Palestinian human rights. What is needed now is action to address the neo-colonial legacy of blood, sweat and tears which has resulted and lingered too long in defiance of Palestinian human rights. The failure of the official centenary celebrations last month to embrace the Palestinians demeans the memory of the fallen Light Horsemen and the Arabs of the Imperial Camel Corp Brigade with whom they served, to say nothing of Feisal and Lawrence’s Northern Army, who drew some 20 000 enemy away to the east of Allenby’s right flank, floating otherwise unprotected in the Negev. Further, given our reconciliation with the Turks we fought at Gallipoli, should we not also be reconciled with the Arabs of the Ottoman 27th Infantry Division, who bore the heat and burden of the day at Beersheba? They had been recruited in Western Arabia and Greater Syria, and the Light Horse believed them to have been locals defending their fields. A century after the battle, the rubbing out of these men from official commemoration is a shameful snub to their descendants. When is a history not a history? When is a book which addresses the relationship between past and present not historical? When it does not use an historical method to discuss human society over time. When it does not analyse historical evidence logically. 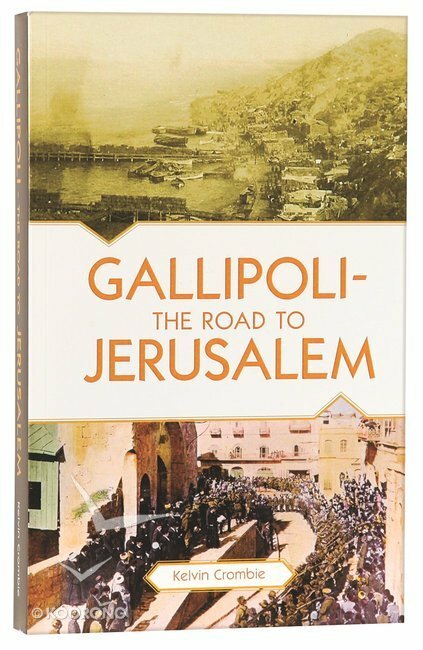 These issues arise regarding Kelvin Crombie’s Gallipoli – The Road to Jerusalem, effectively self-published by his Heritage Resources foundation in 2014. This is the work most pertinent to us out of a series by Crombie, all having the same militarist and Christian Zionist tendencies. The book itself, and its accompanying promotional material, maintain that Australia has a Covenant with Christ and a special relationship with the State of Israel because of the blood shed by the men of the Australian Imperial Force in the Dardanelles in 1915 and at Beersheba in Palestine in 1917. Crombie’s claim is presented as an historical argument. But is it really? How can we tell if it is or not? In view of Crombie’s religious inspiration, the first point that needs to be made is that articles of faith are not historical arguments. The good works of religious people of diverse faiths show that the traditions in which they believe are meaningful ethical inspirations. But articles of faith are not matter-of-fact historical truths. In making no such distinction, Crombie fails to understand this essential point. He baldly reports the Resurrection of Christ not as a significant article of faith but as a simple historical fact. Similarly, he reports the existence of the totemic ancestor of the Semitic peoples, Abraham, as a fact, and a fact regarding the Jewish people alone to boot, to the exclusion of the Arabs who are also biblically ‘children’ of Abraham and inheritors as such of the Holy Land. History is a branch of philosophy, a school of right reason of which truth is the arbiter. ‘Philosophy’ is indeed a word of Greek origin meaning ‘the love of truth’ or ‘the love of wisdom’. Philosophers, historians and scientists, preferring truth to their own opinions, test them. Historical arguments are, accordingly, quintessentially logical. History is an inexact science. But the method of Hippocrates, the father of medicine, and Herodotus, the father of history, are coeval and practically identical. This has been recently reaffirmed by the psychiatrist Ghaemi regarding the mentally afflicted great leaders of modern history, such as Lincoln and Churchill. Theory and hypothesis are tested by reason and evidence. Since the dawn of these twin disciplines some arguments have been known to be formally wrong. That is to say, we have immemorially known some sets of statements to be wrong because they are malformulated and wrong-headed. Philosophers of logic or logicians call these misbegotten arguments fallacies because they are failed reasonings. One class of logical errors are fallacies of causation. Among these fallacies is one known to the Romans and which has great relevance to history. The Romans denominated it in their own language – as you do – so we still know it by the Latin as post hoc ergo propter hoc. Translated into English, this means ‘after the event therefore because of the event’. This cannot be right, because some apparent consequences are only coincidences; the problem is all in the ‘therefore’, in the consequence drawn. Subsequent events are not always caused by prior events. This can be tested by putting an argument in the defective logical form to see if it generates an invalid conclusion. For example, Henry VIII of England executed Anne Boleyn before the Great War; therefore Henry caused the Great War. Clearly, for all Henry’s faults, he did no such thing. Further valid argument is required to demonstrate a causal relationship between a prior and a subsequent event. Recognising this is vital for any valid, scientific historical method. This post hoc causal fallacy does not follow from its premises or presuppositions. It is a mistaken deduction. In the English-speaking historical tradition the causal fallacy is associated with the historians of the proto-liberal progressive Whig aristocratic party, which resisted British divine right absolutist monarchism to shape the English constitution as a mixed regime of oligarchical, parliamentary-limited monarchy. The Whigs were inclined to imply that with them British if not universal history had come full circle to a state of perpetual perfection. In 1931, the conservative Christian historian Herbert Butterfield, following in the footsteps of the conservative philosopher David Hume, contested this Whig interpretation of history. Being conservative, Butterfield did not notice that the Whigs were claiming to be the last word in political and historical progress. Nevertheless, from his Tory point of view Butterfield made the telling point that the Whig theory of history embodied the causal fallacy and was anachronistic. Accordingly, this fallacy has since then been known in the Anglophone world as the Whig interpretation of history, in keeping with Butterfield’s contention that it embodies an error into which any aspiring historian might fall, regardless of politics. 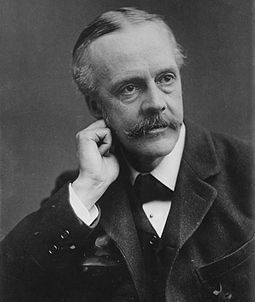 Arthur Balfour, British Foreign Secretary, 1916-19. Trained as a philosopher, he is alleged to have said once, ‘Nothing matters very much and few things matter at all’ (Wikipedia). The point of this logical philosophical disquisition about history is to lay the basis for finding that Kelvin Crombie does not write history, and to demonstrate that the best ground for combatting propaganda is that furnished by a calm and critical command of the truth. Unfortunately for Crombie, his work is based on ignorance of such basic historical principles. This fatally undermines his marshalling of evidence. The yeoman service of research is misapplied to fallacious promoting of essentially religious preconceptions designed to politically harness the Anzac legend, so potent in this country, to the Zionist chariot. Essentially, Crombie argues that the Gallipoli landings were the outcome of secular European interest in the opportunities opened up by the decline of the Ottoman Empire. That Gallipoli was an outcome is true but then comes Crombie’s post hoc ergo propter hoc fallacy. He goes on to argue, in keeping with a chiliastic Christian big picture view of history, that the taking of Jerusalem in 1917 was the ‘natural’ consequence of the landings in the Dardanelles. He misquotes Churchill to imply that the provincial capital of Jerusalem, the centre of Crombie’s evangelical world view, was the heart of the Ottoman Empire at which the Gallipoli landing was aimed. In fact, the heart of the Ottoman Empire was Istanbul, and the strategic objective of the Allies was to take the capital, knock Turkey out of the war, and consolidate a subsidiary South-Eastern Front against the European Central Powers. Crombie then goes on to claim that, because the Australian Light Horse was redeployed eastwards rather than to the Western Front with the bulk of the Anzacs, his point is somehow proven. Nothing could be further from the truth. It is this kind of sleight of hand that is typical of propaganda, a word of curial origin which originally meant ‘information’, as did the modern Hebrew term hasbara. Both words have acquired ironic connotations, not to say worse, and for good reason. The Light Horse did indeed form part of the Egyptian Expeditionary Force which passed onto the offensive under the cavalry general Sir Edmund Allenby. Allenby was under instruction from the British Prime Minister, Lloyd George, to take Jerusalem as a morale-boosting Christmas present for the British people, who were downcast by the hard grind of the Western Front in 1917, the low point of the Great War. Lloyd George brought into greater prominence the subsidiary Eastern Front compared with the strategically more important Western Front. Lloyd George, for all that he was an ‘Easterner’, doubted that the Great War would be won in the east. The most he hoped for was to knock Turkey out of the War by taking Jerusalem where the Dardanelles expedition had failed, and to assert British imperial interests in the region. Allenby carried out Lloyd George’s instructions by opening the road to Jerusalem, with a feint at Gaza and an assault upon the other end of the Ottoman line at Beersheba, spectacularly completed by the famous charge of the Australian 4th Light Horse. So far it is the interpretation which is in dispute rather than the facts. But here again Crombie’s argument is undermined by tunnel vision. He fails to fully appreciate that Allenby, in attacking Beersheba, also had other regional strategic objectives in mind. For example, by advancing into Palestine, Allenby hoped to draw in Turkish troops from Aleppo in Syria – where they were being concentrated for a push on British-held Baghdad in Iraq – and then penetrate north himself. He was successful in this. Therefore, by rights Crombie’s book should be breathlessly entitled Gallipoli – The Road to Jerusalem and Aleppo and Baghdad and Beyond (to say nothing of Damascus with Prince Feisal and TE Lawrence). But such candour would have undermined Crombie’s Jerusalem-centred view of the world. Crombie also allows his religious politics to drive him into belittling Arab involvement in the Battle of Beersheba. He thus ignores Allenby’s own post-war appreciation of it and the contemporary military assessment that the Arab Revolt centred in the holy Hejaz had drawn 20 000 Ottoman troops away from Allenby’s eastern flank. Indeed, Crombie’s account of the Battle of Beersheba fails to emphasise Arab involvement in the battle. 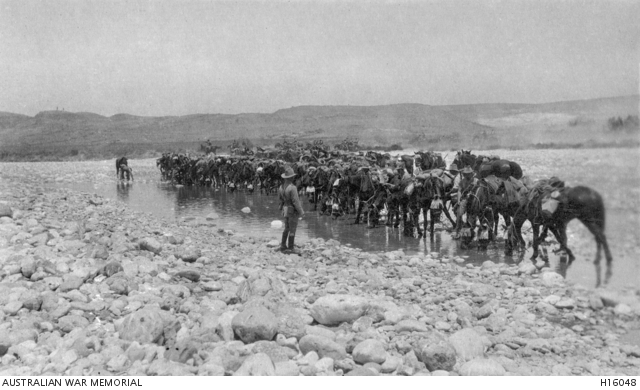 Yet, he acknowledges that a small combined force of British and Hejazi cameleers under a Lieutenant Colonel Newcombe intervened crucially to guard the Beersheba-Hebron road to the north-east of the British flanking manoeuvre against the Arab settlement with its strategic water supply. Even more important – in view of the bonds of war forged between erstwhile enemies – is the fact that the Ottoman defenders of Beersheba were largely Arab. The town was defended by the Ottoman III Army Corp, consisting of the 67th and 81st Regiments of the 27th Division, which had been at Gallipoli and had been raised in Greater Syria and Western Arabia. Some of these troops may well have been Palestinian. Seventy-six per cent of them were Arab. There are no prizes for guessing why the losers at Beersheba are airbrushed out of Crombie’s account; their involvement is an inconvenient truth. Crombie also makes great play of the coincidence that on 31 October 1917, the day of the fall of Beersheba, the British War Cabinet was finalising the text of the Balfour Declaration. This hardly proves that the Light Horse charged – as Crombie would have it – for Zion. By this stage of the war many if not most troopers rode into battle, not for grand causes, but for each other, for their mates. The call of God, King and Empire itself would have been somewhat less compelling than at the start of the war, although religious indoctrination under Reverend Maitland Woods and others was still used to sustain morale. General Allenby was aware of the dramatic historical associations of his theatre of operations, as was the Australian General Sir Harry Chauvel, a Christian and the commander of the Light Horse. 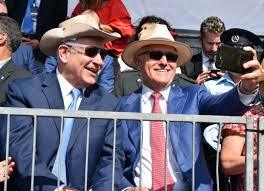 Yet, neither of these officers claimed to be on a mission from God to ‘restore’ the State of Israel. Crombie indeed provides no evidence as to the religiosity of the Light Horse, not a letter, not a diary entry, apart from one isolated incident when he claims a New Zealander raised the Star of David in Jerusalem. And he concedes that even Balfour himself acknowledged that the grace and favour extended in the Declaration to the notion of a Jewish national home ‘to which the Zionists attach so much importance’ would not ‘necessarily involve the early establishment of an independent Jewish State’. That, Balfour opined was in the lap of future developments. Indeed it was. To imply that the purpose and function of the events at Beersheba in October 1917, much less at Gallipoli in April 1915, was to establish and legitimise the State of Israel, eventually founded in 1948, is plain anachronistic. And anachronism is a fundamental historical sin. In the dust from the hooves of the 4th Light Horse outside Beersheba in the gathering dusk of 31 October 1917, whatever was going on in London at the same time, such things were not even thought of. The troopers, after all, carried no mobile phones. Anachronism has political uses, however, and it is these that Crombie’s fallacious and sub-historical arguments serve. While Crombie’s historiography is substandard, the production values of his books suggest no lack of funds. And the author is well connected. A previous version of Crombie’s Christian Zionist argument was delivered gratis to every vice-regal and parliamentary representative in the country in a cultural propaganda effort to win hearts and minds. Light Horse re-enactors were trotted out to fly the Israeli flag to effect a union between Australia’s popular military traditions and the latter-day policies of the State of Israel. But arguments, to be valid historically, must do more than trifle with the past. Before any political implications can be considered legitimate, arguments must pass the test of logical evaluation of evidence. For both history and politics are critical sciences. We need honest history of the involvement of Australia in the events in Palestine of 1917. This Crombie’s book does not provide. For reportage on the contemporary historical and political significance of the Battle of Beersheba and the vested interests involved in its commemoration, see Paul Daley, Beersheba: A Journey through Australia’s Forgotten War, Melbourne University Press, UP 2009. For his warning of the risk of the centenary commemorations being suborned see his ‘Beersheba: we must keep an eye on how the story is told and interpreted’, Guardian Australia, 31 October 2017. Kelvin Crombie, Gallipoli – The Road to Jerusalem, Heritage Resources, Mundaring WA, 2014, p. xvi. 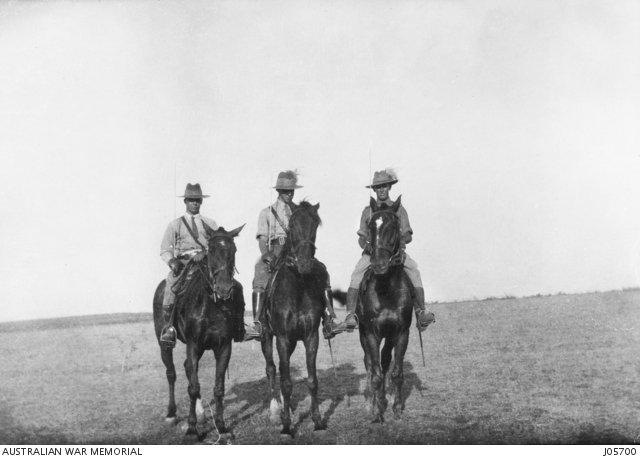 Mr Crombie’s consultancy to the Australian Light Horse Association’s 2017 tour was advertised on the ALHA website. Foreword, Major General the Honourable Michael Jeffery in Crombie, Gallipoli, p. ix. The video. For a more recent and secular view of the Gallipoli campaign emphasising German strategic involvement, see John F Williams, Deutschland uber Allah! Germany, Gallipoli and the Great War, Australian Scholarly Publishing, Melbourne 2016. For a view of the campaign based on Turkish sources, see Harvey Broadbent Defending Gallipoli: The Turkish Story, Melbourne University Press, 2015. Of great historical interest in this connection is the staff-work study by then Colonel later General George S Patton, The Defense of Gallipoli: A General Staff Study, US Army, Honolulu, 1936. This was used as a model for planning D-Day, given that the flawed Gallipoli landing was the greatest precedent of an amphibious assault in history. For a critique of such views, see Jonathon Cook, Israel & the Clash of Civilisations: Iraq, Iran and the Plan to Remake the Middle East, Pluto Press, London, 2008. See, for example, Russell W Glenn, Short War in a Perpetual Conflict: Implications of Israel’s 2014 Operation Protective Edge for the Australian Army, Department of Defence, Canberra, 2016; Anthony Bergin & Efraim Inbar, The Wattle & the Olive: A New Chapter in Australia & Israel Working Together, Begin-Sadat Centre For Strategic Studies/Australian Strategic Policy Institute, Canberra, 2016; Anthony Bergin ‘Synergies at stake in better ties with Israel’, The Australian, 3 March 2017. Not that the Anzacs were without human flaws. For particulars of their base camp behaviour and their all too contemporary racial attitude towards the Arabs, see Suzanne Brugger, Australians and Egypt, 1914-19, Melbourne University Press, 1980. And, of course, elements of the Light Horse were dressed down by Allenby personally for the war crime committed against Palestinian villagers at Surafend on 10 December 1918 (see Daley, Beersheba, and other sources). Paul Daley, ‘Beersheba centenary: let’s remember that story is not the same as history’, Guardian Australia, 30 October 2017. WH Dray & WJ van der Dussen, ed., Collingwood: The Principles of History , Oxford University Press, 1999, p. 140. See the flyer, ‘Heritage Resources: Our Heritage in the Land of Israel & in Covenant’, undated. Nassir Ghaemi, A First Rate Madness Uncovering the Links between Leadership and Mental Illness, Penguin London, 2011, p. 8. Herbert Butterfield, The Whig Interpretation of History, Penguin, London, 1973 (first published 1931). Crombie, Gallipoli, pp. xii, 604. For a biography of Allenby, see Lawrence James, Imperial Warrior: The Life and Times of Field Marshal Viscount Allenby, 1861-1936, Weidenfeld & Nicolson, London 1993. For Allenby’s select correspondence during his time as commandant of the Egyptian Expeditionary Force and High Commissioner in Egypt, when the Levant was conquered and the basic political framework for the modern Middle East laid down, see Matthew Hughes, ed. Allenby in Palestine , Stroud, London, 2004. For the current history reportage of embedded journalist WT Massey, see How Jerusalem was Won: Being the Record of Allenby’s Campaign in Palestine, Project Gutenberg EBook. 2003. Of like interest is Frederick Sadlier Brereton, With Allenby in Palestine: A Story of the Latest Crusade , Blackie & Son, Glasgow, 1920. The strategic morale-boosting Xmas present of taking Jerusalem is mentioned by, among others, Jean Bou Light Horse: A History of Australia’s Mounted Arm, Cambridge University Press, 2009, p. 177. For analysis of the British push against Gaza, and especially the third battle, in which Beersheba was enveloped, see John D Grainger, The Battle for Palestine 1917, Boydell, Woodbridge UK, 2006. In the course of these operations, Gaza was devastated by bombardment, creating an enduring internal refugee problem. See Dotan Halevy, ‘The rear side of the front: Gaza and its people in World War I’, Journal of Levantine Studies, Vol.5, no.1, Summer 2015, pp. 35-57. For a panoramic view of the imperial vision of the UK for Palestine in regional context, see Matthew Hughes Allenby and British Strategy in the Middle East 1917-1919, Frank Cass, London 2005. Ian Jones is quite definite that many of the defenders of Beersheba were local farmers who formidably defended their fields and a settlement associated with their totemic ancestor Abraham. See his ‘Beersheba: the Light Horse charge and the making of myths’, Journal of the Australian War Memorial, No.3, October 1983, pp. 26-37. Edward J Erickson, Palestine: The Ottoman Campaigns of 1914-1918, Pen & Sword, Barnsley UK, 2016, p. 101. For this juxtaposition see Crombie, Gallipoli, pp. 529ff. For a recent reconstruction of the developments which produced the Arab-Israeli conflict, see Jonathan Schneer, The Balfour Declaration: The Origins of the Arab-Israeli Conflict, Bloomsbury, London, 2010. For US embroilment in these machinations see Chapter 2 of Lawrence Davidson, America’s Palestine: Popular and Official Perceptions from Balfour to Israeli Statehood, University Press of Florida, Gainesville, 2001. The role of military chaplains is referred to in Ion Idriess, Desert Column, Angus & Robertson, Sydney, 1941, p. v; Chaplain Maitland Woods is particularly referred to at pp. 289-90. Crombie makes this claim in Gallipoli, p. 597. Cited from Cabinet papers in Crombie, Gallipoli, p. 538. Anzacs & Israel was distributed by ‘numerous individuals and organisations’ to ‘all of Australia’s political elite’, and was mentioned in the Senate in February 2011 by Tasmanian Senator Guy Barnett. I arrive late in offering a comment, but I feel compelled to do so. Some contributors have referred to the Light Horse as making a cavalry charge. They did not, and are not cavalry. Cavalry fight mounted and Light Horse fight dismounted. The horse was a means to more quickly advance the men of the Light Horse to the point where they could make contact with the enemy. At Beersheba the Light Horse fought as infantry, dismounted and employing rifle and bayonet.